Last June I met back up with Chelsea and Adam on a sunny day in Akron. Thankfully their wedding day was a lot warmer than their engagement session! 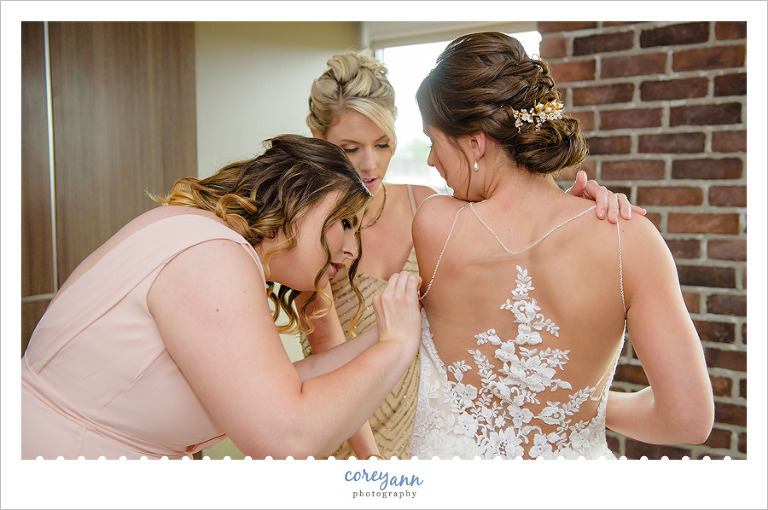 I always love when my couples are able to incorporate their love story into their wedding day. 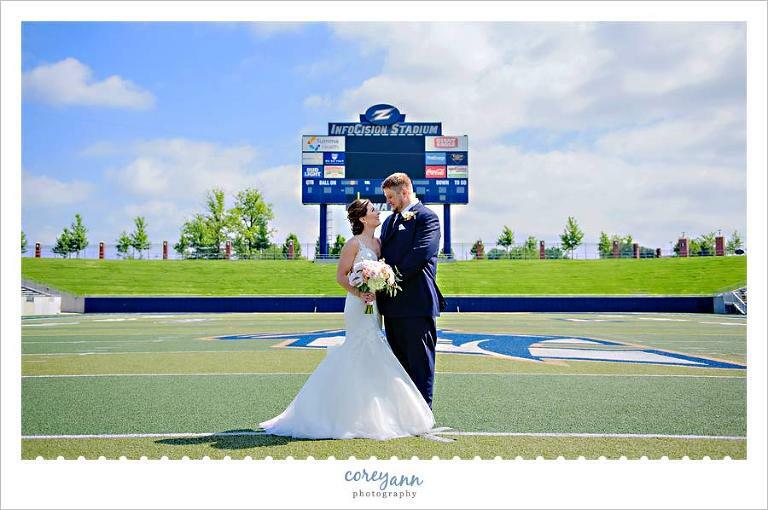 Chelsea and Adam met at InfoCision Stadium at the University of Akron so it was a perfect spot to celebrate their wedding! I love how it tied it all together. I don’t know that I’ve ever had a groom smile as much as Adam did every time he saw Chelsea. I DO know that I’ve NEVER had a Groom and his Dad breakdance at the reception together. That was an amazing first and I hope not the last! Thank you both so much for trusting me with your wedding day! I started out with Chelsea and her ladies at the beautiful new Courtyard by Marriott in Downtown Akron. I hadn’t been to the hotel yet and was wowed by how pretty it is! Highly recommend it for those looking for a place to stay/get ready for their wedding when in Akron! I loved the way the light was coming in around Chelsea’s veil when she put it on at the church. 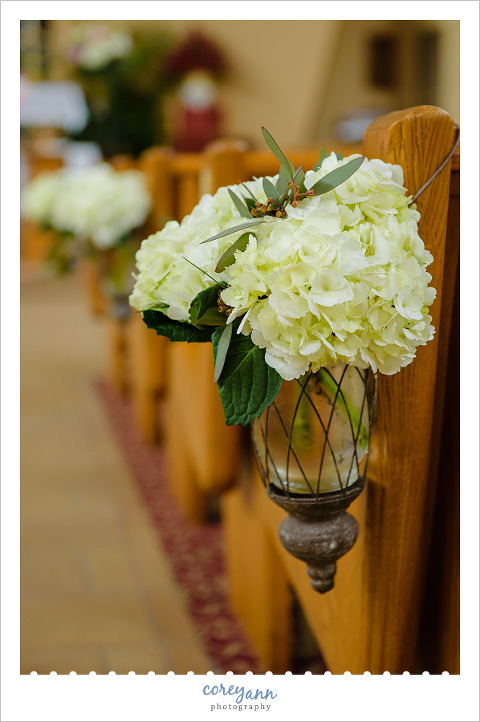 I am in love with these beautiful pew decorations that Pink Petals Florist made for their wedding ceremony to decorate the pews. The vases are SO neat! I love the look on Adam’s face when he’s finally able to take a proper look at how stunning Chelsea looked! This smile was on his face ALL day. I smile every time I look at this image! Finally it was time for the vows and they were perfect! As always, the moments after the kiss remain my favorites from the day. They opted of a bubble exit from St. Paul Catholic Church and it was beautiful! I love, love, loved that Chelsea chose varying pink gowns for her bridesmaids. The look was so elegant and perfect! Fake laughs turn into real laughs EVERY TIME. Adam and his groomsman had a lot of giggles built up but they were so much fun to work with. Where else would you go with a bunch of football players? I’m so glad we were able to utilize the field at InfoCision Stadium at the University of Akron! Gotta have the “walk and talk” with the guys. I have a feeling they’ve done this a few times on this field. I sent the bridal party up to the reception and stayed with Chelsea and Adam down on the field for a few more minutes. I loved this photo so much! Adam then dipped Chelsea and it was perfect! I don’t know what it is about these two photos but they are some of my favorites from the day. I love both this color and the black and white of it. I also need to give a shout out to the amazing florist, Pink Petals. They did a beautiful job with all of the flowers, especially on Chelsea’s gorgeous rose and peony bouquet! One last photo in the shade before heading up to their reception in the Press Box. Bittersweet’s did an amazing job with their cake! It was HUGE! I absolutely loved everything about the reception centerpieces that they had. From the gold table numbers to the vases to the florals = it was perfection! The cake cutting was a wee bit messy! After Chelsea cleaned up from the cake cutting they had their first dance at their wedding reception at InfoCision Stadium. All night long all the little girls were coming up to Chelsea and admiring her dress. It was so sweet and cute! There was a TON of dancing! Drop the Mic Entertainment kept everyone hopping all night long. Adam and his Dad doing a coordinated worm move. I am still in awe. It was awesome! Ending the day with their beautiful rings in one of the roses from Chelsea’s bouquet! I love that gold is making a comeback!